← It’s been awhile…but I’ve been busy as HELL! I have all of the mosaic work done, except for the rest of the little faces. Once those are done, then I can mount it in a frame, I’m leaning towards oak, as oak is tough, sturdy stuff that grows all over the place, like people. Oak is a beautiful wood, one that is fine grained, which is what makes it a hardwood, and that makes it tough. Today I spent working on the little faces. I have all of the male faces done, now I just need to finish the female faces. I do each one separately, each is about an inch and a half high. I like to do them in clay, because the wax is hard to detail like the clay. The clay lovingly accepts the strokes from my tools, my fingertips. The clay takes one twist to completely change the entire face; a twisted lip, an eyebrow raised, all of these change the little faces and make them individual. After each is done in the cast glass, then I’ll glue them to their spot on the tree. Someday I’m going to fire these little clay heads, in my ceramic kiln, to keep them safer. For now, here’s images of today’s little faces. 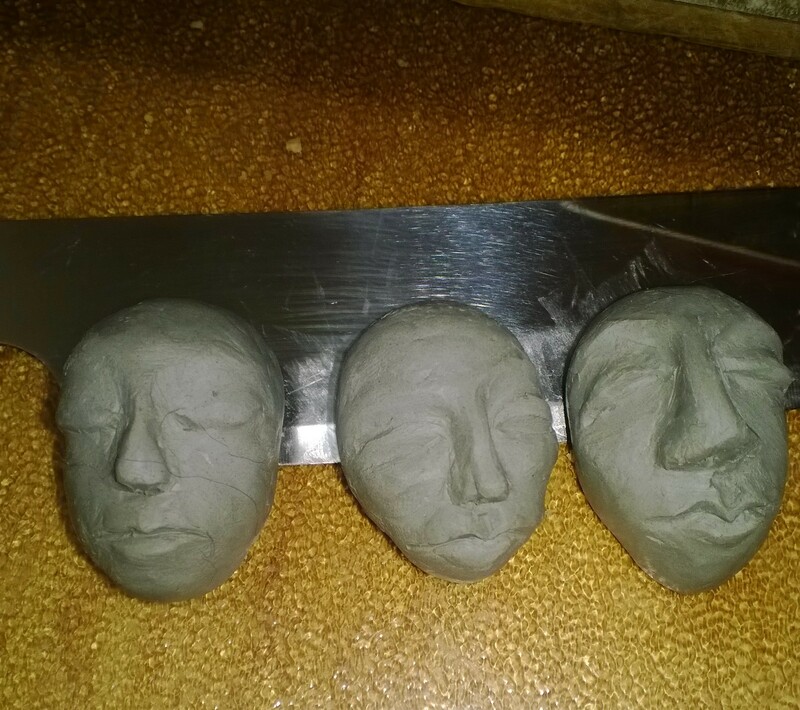 Some of the little clay female faces for the Tree. The next step is to wait for these to dry out a bit, then to cover them in latex mold material. After the mold is made, then I’ll fill them with the brown casting wax. Then those go into the glass casting mold material. Once the plaster hardens, I put these in a convection oven and melt out the wax, leaving the mold for the glass. The glass, in big chunks, goes into the space and at the end of all of this, we get glass heads, like so, see pic below. Tomorrow I have three of these little ladies left to do, as well as the latex on the clay faces from today. After that, then the braces across the back. I’ll be putting three across and one long down, to remove a slight bow from the glass. Glass is pretty heavy; it accumulates weight as we go and with the addition of the grout, it gets really heavy. I’m looking forward to getting it in a frame, so I can get the backlighting done. These look pretty without light, but it’s the light through the glass, making the little flaws as part of the design, that sends these into the realm of art. The backlighting makes it or breaks it. I’ll post the pics of it lit as soon as I get the piece with lights behind it. I’m a real fan of the LED lights. I like the pure blue quality of the light, the way it illuminates the glass without influencing the glass. The color of the back lighting affects the color of the glass. A yellow light, the warm light, is useful for some glass, but for the mosaics with a lot of different colors and ranges of warm and cool color, the cool, white light LED’s are best. They are more of a sun type light, which is really the best light, for color clarity, as long as its not too bright. I also like the fact that the LED’s are dimmable, they are compact, and they last for years. I also like that they stay cool, so I don’t have to worry about heat. The pieces don’t get hot, so they stay safe, as well. Safety means a lot to me, because people see these, and they are often compelled to touch them. They often extend their arms, with wide eyes and one finger outstretched to touch the piece. It’s like they just can’t help themselves, the light and the glass call to be touched. I feel that since I know that, it’s my responsibility to make the piece as safe as one can make a piece of art made out of broken glass. This entry was posted in Art_WIP, Uncategorized and tagged art, art glass, art glass mosaics, art glass mosiac, DNA, faces, genetic, genetic adam, genetic eve, glass faces, illuminated art glass mosaics, illuminated mosiacs, mtEve, tree of life, YAdam. Bookmark the permalink.